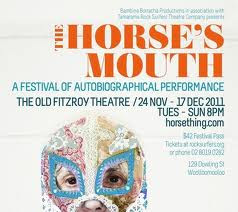 Kevin Jackson's Theatre Diary: The Horses Mouth: "'Hell For Leather"
Bambina Borracha Productions in association with Tamarama Rock Surfers Theatre Company presents THE HORSE'S MOUTH - A Festival of Autobiographical Performance at the Old Fitzroy Theatre. THE HORSE'S MOUTH - A Festival of Autobiographical Performance , is made up of three programs: Bolted, Hell For Leather & One Trick Pony. 10 writers, 11 actors and directors have been curated and present essentially a collection of monologues. I attended the second program, 'Hell For Leather': THIS IS NOT A POSSUM written and performed by Zoe Norton Lodge and HOME written and performed by Jono Burns. Both of these pieces are extended monologues, almost, short one man (woman), one act plays. THIS IS NOT A POSSUM is a very interesting long prose/poem that is whimsical, amusing and very, very absorbing. Ms Lodge performs the piece with a very serious and slightly neurotic energy. The acting skills are relatively limited (with shouting an option often elected for emphasis), but totally attractive and cleverly, communicative. It has a modest confidence and inspires surrender to the world and incidents created. Accompanied by a musician (Emily Irvine) with small but well placed percussive supports and mood settings the language of the carefully written piece are arresting and intriguing. The video-media offers (Vanessa Hughes) seemed to be really extraneous and ultimately distracting - unnecessary, really. The text and the performance stand on their own very, very well. I enjoyed it enormously. It could perhaps be slightly pruned. My concentration wavered a little in the last two thirds. HOME by Jono Burns is a long 60 minute piece that is definitely autobiographical. Based around Mr Burns New York Acting Training Course, we are taken on a journey of encounter with the diverse members of his class and teachers and other wild denizens of the city. The writing follows a well worn path of actors telling stories of their training and crises of living in a strange place and although the subject matter is over familiar the structure of the piece, intruded by an emotional connection to affairs way back at home in Australia gives the monologue an equilibrium of comedy and an arresting emotional maturing of the storyteller. One is pleasantly teased to stay 'hooked' to the experience. The writing is clear and well observed. The skill of Mr Burns as a performer adds enormously to the pleasure of this storytelling - he creates swiftly and convincingly a wide range of characters and manages, mostly to remain 'plugged' into the swift emotional and technical adjustments demanded by the writing. Two innocuous but charmingly innocent musicians create musical interlude and brief character observers- interactors during the action. Neither are credited in the program. A delightful and unpretentious sophistication about the whole piece. Is it slightly too long, Jono? Tim Spencer, Phil Spencer, Zoe Coombs Marr make up the first program: BOLTED. Scarlett Mcglynn, Betty Grumble, Alex Vaughan, Nick Coyle and Lucinda Gleeson make up the third program: One Trick Pony. Playing alternate nights until 17th December. Grumble to the producers: I just hate a show beginning late. I hate it even more when a show begins late without any explanations. The night we went, it was almost 8.20pm before it began. What, the actor was not available or what? We were all there on time and we didn't have to be there to start with. No explanation and worse, no apology! Just plain discourteous to your paying public. 8pm means 8pm in the real world. If the Ms Lodge had not been so winning, so quickly I would have been ropeable and not too sympathetic to their efforts. It is about the pre-show vibe as well, you know? I too absolutely hate a show going up late but it seems to be a tradition at The Old Fitz. Also the 70 minute running time promised last night seemed to be a bit of a gentle lie. I left early at 9.45pm with one show still left to go. Perhaps I'm showing my age? I loved both these shows, and to the contrary, I loved the media components of Norton Lodge's show. I think its great she took risks with the production, and above all it was funny.